We are a leading Wholesale Trader of designer sarees, saree, sarees, designer sarees, georgette saree and indian designer saree from Surat, India. 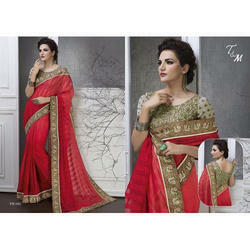 Our valued customers can avail from us a comprehensive array of Designer Sarees for which, we are well-known supplier. Manufactured in conformation with the modern trends of market, these sarees are highly appreciated across the market by our valued clients. Moreover, a creative team of our designers, which designs the entire offered range as per the demands and needs of our valued customers to provide an optimum level of satisfaction them. Keeping in sync with the ongoing fashion trends and developments, we are involved in offering H RAZ Saree that is available in various sizes and patterns to meet the diverse needs and demands of the clients. Fabricated from the finest quality fabric and the progressive technology, these sarees are also properly tested against numerous parameters by quality controllers. 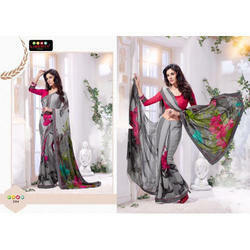 Moreover, we are providing these sarees in best packaging material at most economical rates within promised time frame. Owing to our state of art manufacturing unit, we are pioneers in the industry by offering the best collection of Sarees. These sarees are stitched by our skilled and experienced designers and are known for their unmatched quality and excellent finish. A team of dedicated quality controllers are committed to assuring the quality of these sarees, before dispatching them to the customers. For this, they perform stringent quality assurance tests on these sarees. Our valued clients prefer these sarees owing to their attractive colors, exquisite design and strong seams. With help of our sophisticated fabrication unit, we come up with an optimum quality grade assortment of Tanu Weds Manu Designer Sarees. Our offered sarees are fabricated employing the finest quality fabric that is bought from trustworthy and reliable suppliers of market. This saree is extremely demanded in the market owing to its optimum quality and exceptional finish. 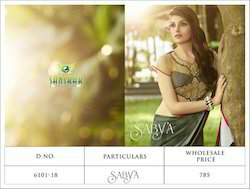 To suit the client’s requirements, these sarees can be availed in various sizes and colors.